Welcome to The Abso!ute Sound online! We explore music and the reproduction of music in the home. We believe that the sound of music, unamplified, occurring in a real space is a philosophic absolute against which we may judge the performance of devices designed to reproduce music. Our goal is to provide the resources consumers need to judge how a component's sound either honors or departs from the music's truth, and to make sound purchasing decisions that maximize their experience of reproduced sound. 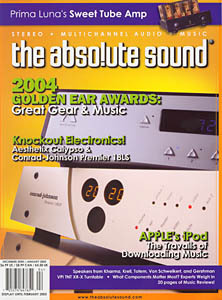 Below is our Issue 151, December 2004 / January 2005 table of contents and editorial. Anthony H. Cordesman on the VPI TNT HR-X and 12.6 Tonearm. Bob Gendron takes an in-depth look at Apple's red-hot music player. More on the latest incarnation of Living Stereo by the man who wrote the RCA Bible, Jonathan Valin. Our annual year-end roundup of components that have won our hearts — and ears. Robert Harley auditions the Aesthetix Calypso linestage and Rhea phonostage and discovers that state-of-the-art performance doesn't always command a stratospheric price. On page 74, Anthony H. Cordesman reports on the solid-state Conrad-Johnson Premier 18LS Preamp and Premier 350 Stereo Power Amplifier. New writer Jeff Dorgay reports on an affordable tube amp, and adds his nomination for the next Nobel Peace Prize. Wayne Garcia and Neil Gader offer two similar (and not so similar) takes on Totem's latest little guy. Causing a stir in the high-end world, the VR-4jr gets a thorough evaluation by Sue Kraft. Fred Kaplan on Krell's latest foray into speaker design. What's four-and-half-feet tall and pointy-headed? Wayne Garcia explains the sound and technology behind Gershman's Gap. Wayne Garcia, Harry Pearson, Jonathan Valin, Linn Products Founder Ivor Tiefenbrun, and Wilson Audio Founder David A. Wilson debate the role of each component in the playback system; Robert Harley moderates. Next, a bevy of surprises in a 13-page HP's Workshop, and Jonathan Valin describes The Best Stereo System He's Heard, Part Two. Fred Kaplan, Sue Kraft, and Chris Martens. Pleased to meet ya — Fred Kaplan, Sue Kraft, and Chris Martens.